KANSAS CITY, Mo. — More Americans could fly Friday than any other day of the 2018 Christmas vacation period. The advocacy group Airlines for America predicts airports will see the most traffic on Friday, Dec. 21. Overall, A4A estimates more than 45 million people will fly across the United States between Thursday, Dec. 20 and Sunday, Jan. 6. 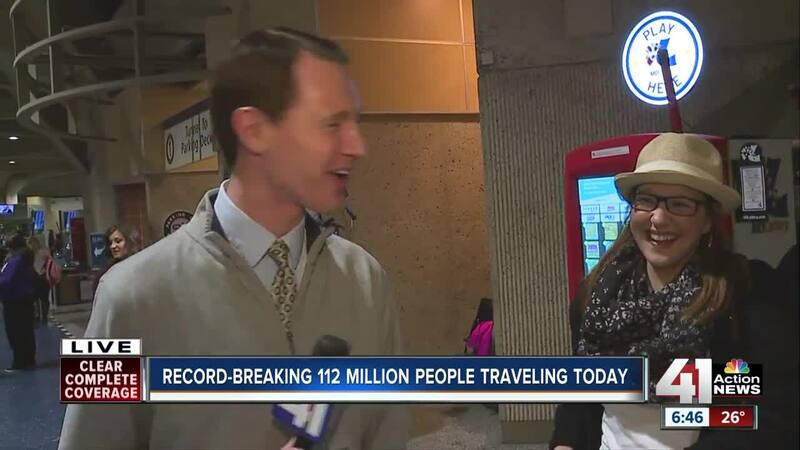 That prediction is about 2 million passengers more than last year during the same period. Locally, Kansas City International Airport expects roughly 585,000 passengers to fly over the Christmas and New Year travel season. Because of the increase in passengers, KCI spokesman Joe McBride recommends travelers arrive 90 minutes before their departure time. The Transportation Security Administration (TSA) expects to see a record-breaking number of travelers over Christmas. It set a record for Thanksgiving this year. To help passengers get through checkpoints quickly, TSA suggests flyers keep any gifts unwrapped or in gift bags. Agents may have to unwrap a present to further inspect it. Electronics are most likely to require further inspection. KCI recommends printing both a copy of your boarding pass and downloading a mobile boarding pass, if available through the airline. McBride said having both will guarantee you can avoid any delays due to a computer glitch. If you are picking up someone at KCI, the airport is asking you to wait in the free cellphone lot until the traveler deplanes. Police will ticket and tow cars parked along the terminal curbs. You can check the status of flights in and out of KCI here .